Every now and then, you pick up a guitar and it’s perfect from minute one (or at least, right after a quick setup). Other times, you’ve got to take a perfectly good guitar and completely overhaul it just to make it your own. This is the story of a perfectly good guitar that fell victim to a burst of inspiration. I’d been wanting a semi-hollow guitar for some time, but it was a daydream long before it became a reality. At the outset, I just knew I wanted it to be cool. Duh. I also knew that I wanted a guitar with P-90s. I already owned a Fender Telecaster (single coil) and a Gibson Les Paul Standard (humbuckers) and this seemed like a good way to help round out the “standard” pickup sounds in my arsenal. And I knew I wanted an Epiphone. 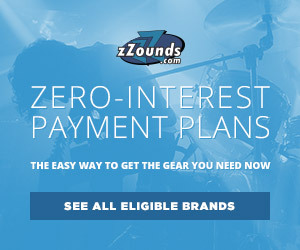 They’re well-built, play and sound great, and are nearly unbeatable for the price. 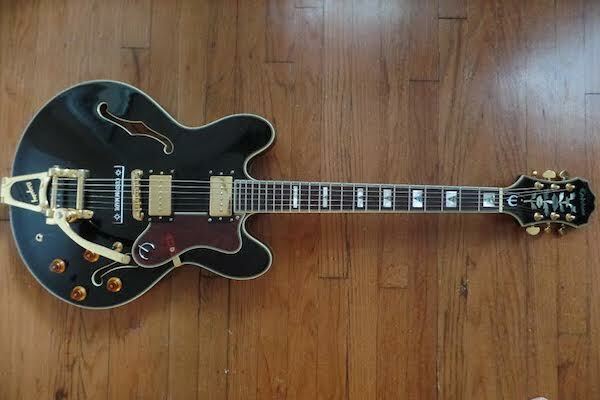 This 2006 Epiphone Sheraton features a pair of howling Seymour Duncan Phat Cat P90’s, a Bigsby B7 tailpiece, and a “Custom Made” plaque that harkens back to the early days of the Gibson ES-335. Figured I might as well go for the gusto. The pickups actually took more time to decide on than the guitar itself, but I eventually landed on Seymour Duncan Phat Cat P90s – great price, stellar reviews, and the option to get them in gold, which would match all the other hardware. I was blown away by the sound. I didn’t hate the stock humbuckers – far from it. In fact, I liked them so much I second-guessed myself on the Duncans all the way up until the moment I tried them for the first time. Here’s a couple samples of how the P-90s sound in comparison to the stock humbuckers. 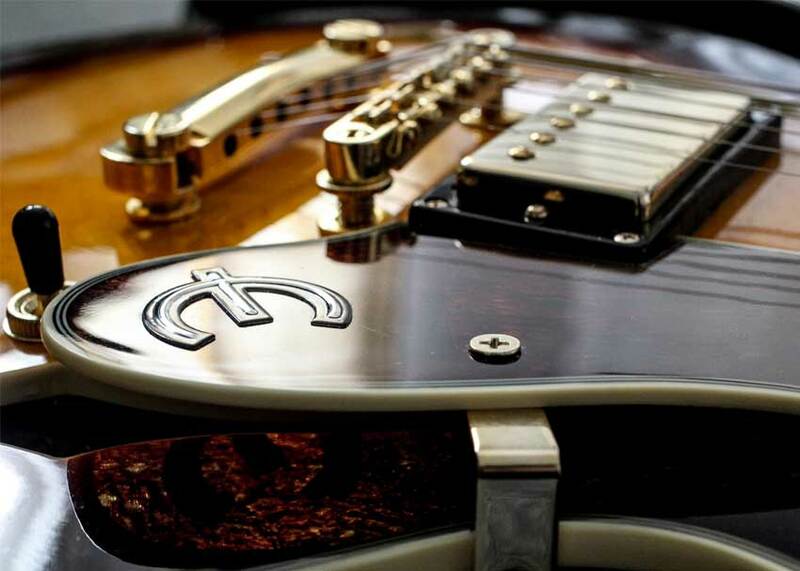 In the first clip – demonstrating the clean tone – the Phat Cats are first, followed by the humbuckers. 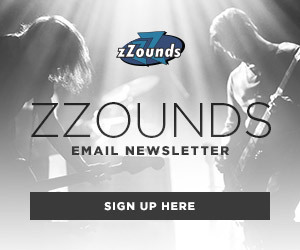 In the second example — this time loud and dirty — the humbuckers lead off the comparison. They’re incredible. I’m not much of a high gain player, so I like to keep them dialed back until just before the point at which they’d start to break up. I keep my amp (a Fender Vibrolux) set accordingly – not too much gain, but enough to put a little dirt in an otherwise creamy tone – and voilà: it’s a rhythm guitarist’s dream. Sheraton P-90 pictured with my 1976 Fender Vibrolux. Bill Furray insisted on staying in the picture. In terms of effects, I mess around with a bunch, but my favorite for this guitar/amp combination is my Earthquaker Devices Chrysalis overdrive. They don’t make that one anymore, and it’s understandable why: EQD President Jamie Stillman explained to me that the noise floor was too high in the Chrysalis, and to be fair, it does get pretty noisy. No worries. If you want that sound, pick up the Palisades. It features the same Tubescreamer-style tone with far more options (two gain styles, six clipping voices, and FIVE bandwidth styles!) with none of the noise issues. I also like a nice slapback delay to give my playing a bigger “room” sound, and for that I look no further than the MXR Carbon Copy. If you want a souped-up Sheraton, but don’t want to go through the hassle of replacing pickups like I did, check out the Sheraton II Pro, which features coil-tapping humbuckers, a Graphtech NuBone XL nut (killer upgrade) and that wine red finish that’ll always remind me of learning Strokes songs in my friend Mark’s garage back in high school. Nice write-up …. I tried this guitar out recently (a vintage sunburst one) and it immediately felt comfortable and I loved the various sounds (through a Vox AC-15 at the shop). I love the fact that you can split either or both humbuckers into single coil pickups (blending them in the middle pickup selector setting in various ways with the volume knobs would allow various sound options). I have an old 1970’s “El Degas” ES-335 copy with a split coil switch but it affects both pickups … I tend to like the split coil sound with a clean amp sound and some reverb or delay. The Sheraton II Pro I tried really felt like a guitar I’d like to get some day for sure! 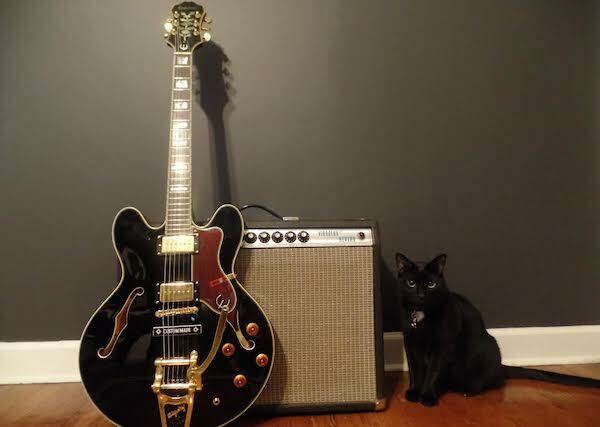 I love the Bigsby on your black Sheraton pictured here… and Bill Furray really adds to the whole vibe!! As someone who has been looking at some Gretsch guitars (G5120, G5420) as well as the Epiphone Emperor Swingster, the Bigsby on this Sheraton is another appealing option.